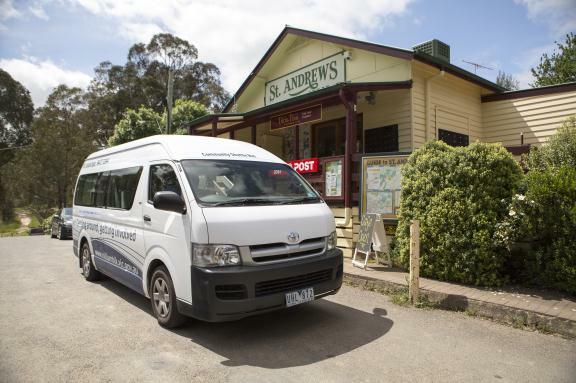 The free Saturday Community Bus runs thanks to a dedicated group of St Andrews parents who initiated the service with support from Nillumbik Shire Council and the generous volunteers who drive the bus. Gold coin donations are encouraged from all passengers to help cover the cost of fuel. The bus travels from Hurstbridge station to Panton Hill, Smiths Gully, St Andrews, Cottles Bridge and back to Hurstbridge train station. It is a great way to visit the market, or venues such as the Panton Hill Hotel for lunch, without having to worry about parking. You can download the Saturday Bus Spring-Summer timetable (0.22MB) or pick up a printed copy from the bus driver, the general stores at St Andrews, Smiths Gully and Panton Hill, or by calling 9433 3723 or emailing community@nillumbik.vic.gov.au. For all the latest updates, become a friend of the Saturday Community Bus on Facebook. Saturday Bus on YouTube There is a short film about the Saturday Bus on YouTube. St Andrews Community Market is now sponsoring the Saturday Bus service. The sponsorship agreement will support the Saturday Bus service by covering the cost of bus promotions, fuel, as well as volunteer police, working with children and medical checks as well as provide promotional opportunities for the St Andrews Community Market.